The national instrument of Armenia is a popular item at souvenir places such as vernissage. Duduk's tender and fragile sounds are spreading throughout the majestic Armenian mountains, telling our history in the echo lost far beyond. "This 35 centimeter-long small instrument contains the history of the one entire nation," believes world-known duduk player, Jivan Gasparyan. The deep and velvet sounds of the duduk come alive when Armenian melodies are played. Even cheerful melodies are tinged with grief when sounded in the unique tone quality of duduk. 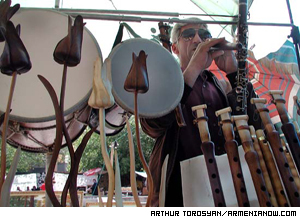 The Armenian duduk is made exceptionally from the wood of the apricot tree. Duduks made from apricot trees growing in the mountainous areas of Armenia are even more prized. "Apricots of the mountainous parts of Armenia are sweet and have the unique taste and wood of apricot trees from those areas sound sweet and unique as well," says Liova Manukyan, a duduk maker and master with 30 years of experience. The musical ancestors of the duduk existed as long ago as 4,000 years ago. These musical instruments were found in Egypt, however, its use was more widespread in the Caucasus. It takes several hours to craft this Armenian delicate musical instrument from unshaped pieces of wood. Duduks have eight holes and one thumbhole. The instrument is 12 millimeters in diameter and the holes' distance from each other are made in accordance with the notes. If the note is lower, then a hole is made deeper, and vice versa. A ghamish (a tube made of reed) is placed at the end of the duduk and it plays the role of mediator between the player and the duduk itself. You can purchase hand-crafted duduks at vernissage, the popular outdoor craft market held every weekend in Yerevan, from masters who make the instruments themselves. If you are lucky, you can catch them in their spare time relaxing and playing the duduk for a break from Vernissage's bustle. Prices vary from $10 to $25 per instrument. Cheap duduks are not tuned correctly and are for non-professionals. The more expensive duduks can be used as professional instruments. Duduk master Samvel Grigoryan assures that the process of making duduks lasts several hours, however, for tuning the duduk correctly it can take several days. "I'm sitting next to a piano for hours or check the sounding of new duduk with a tuning fork," says Grigoryan, who is a musician with 25 years of experience and has become a duduk craftsman. Stepan Hakobyan, another duduk maker at Vernissage, comes from a family who inherited the art of making duduks from their grandfathers. 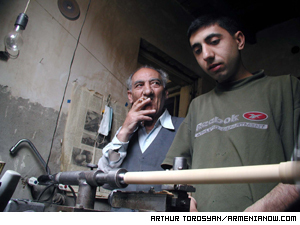 Hakobyan says it takes only three hours for him to turn a piece of wood into a duduk. It takes an apricot tree and a specialist to make a duduk. "It's not hard to make a duduk, however, new things have just appeared such as notes and tuning. I'm trying to tune it a little, but whatever you do, the duduk will sound good anyway." Selling duduks is seasonal. More instruments are sold in September when many children need them for their music lessons. In the winter and summer months on weekends, only an average of two duduks are sold. Gevorg Dabaghyan and Jivan Gasparyan are among the best players of Armenian duduk. Gasparyan is considered the face of Armenian duduk. His recent contributions to film scores such as "Gladiator" have brought new attention to the largely-unknown wind instrument. In concerts across the world, Gasparyan and Dabaghyan have presented an ancient instrument to new audiences. "Once when I was 10, I heard the duduk and I fell in love with it. After the concert I approached duduk player Margar Margaryan and asked him to give me a duduk. He replied, "Go, learn something, find a job and become someone." But the sound of the duduk had pierced the soul of young Jivan too deeply. He became someone with the help of this instrument. "I gathered bottles and handed them over for recycling," Gasparyan recalls with a nostalgic smile. "Then I went to Margar Margaryan holding a lot of 20 kopecks (coins) in my palm. I gave these kopecks to him and told him to give me a duduk. "He didn't take my money, of course. He silently kissed my forehead and gave me a duduk. I saw him several months later and played the duduk in front of him. His eyes filled with tears. "He took a better duduk out of his pocket, gave it to me and said 'Continue playing, you will become someone'."